Kate Symes took her first improv class because she gave a toast at a wedding, people laughed, and she got a big head about it. 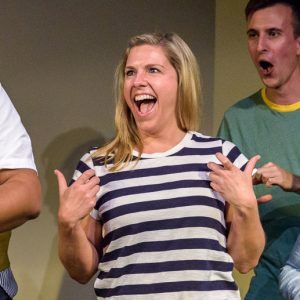 Kate has been performing improv in DC since 2010, and teaching since 2011. She started her training at DC Improv and continued on at WIT. She studied acting, voice, and movement at Studio Theater in DC. She’s taken classes in improv and sketch writing at Second City in Chicago, and workshops with teachers from UCB, Magnet, and People’s Improv Theaters in New York. Kate is one-third of the team Going to the Movies Alone (2015 FIST Champions and general trouble-makers). She was previously on a few other teams – Commonwealth, The Haddington Club, Sistine Robot, Press Play, and others you’ve never heard of (RIP Dr. Girlfriend). You may also have seen her in WIT’s project shows like Yearbook, Improv Actually, The October Issue, and POTUS Among Us. Or her magnum opus, the SoulCycle on tricycles show during 2017 Improvapalooza in which sh*t got real, fast. In addition to her improv performance, Kate is directing The Fourth Estate, a WIT Director’s Series show that will debut in January 2019. Kate wrote and directed a web series called The Newsroom, and has been featured on several podcasts nerding out about improv. She sincerely thanks her 15 dedicated viewers and listeners. As a member of WIT’s faculty since 2011, Kate has delighted in teaching all levels of students the principles of improv – support, agreement, listening, and exploration. Kate is passionate about helping students find their sense of self-confidence, rediscover their ability to play, and take the skills they learn in the classroom into their daily lives or onto the stage. She also thinks it’s cool as heck to play games and laugh with other funny folks LIKE IT’S HER JOB. I can sing all the books of the New Testament to the tune of The Battle Hymn of the Republic, and it is LIT.